Maintain Punitive Segregation housing to segregate housing to segregate inmates who have demonstrated violent behavior or have violated the law or Inmate Rules while incarcerated within the NYC Department of Correction, except for the Rose M. Singer Center (RMSC) which will be governed by its own Command Level Order (CLO). In accordance with the procedures delineated in this order, inmates placed into Punitive Segregation or Pre-Hearing Detention status will be held under lock-in for up to twenty-three (23) hours a day, except when participating in daily recreation or other mandated services. A. Use Pre-Hearing Detention and Punitive Segregation as the most restrictive security statuses that can be assigned to an inmate. B. Maintain Punitive Segregation housing to segregate inmates who have demonstrated violent behavior or have violated the law or Inmate Rules while incarcerated within the NYC Department of Correction. In accordance with the procedures delineated in this order, inmates placed into Punitive Segregation or Pre-Hearing Detention status will be held under lock-in for up to twenty-three (23) hours a day except when participating in daily recreation or other mandated services. 1. Inmates whose disciplinary hearings have been adjudicated and have been found guilty, receiving a specific sentence, shall be placed into punitive segregation. 2. Inmates who are under investigation for, or are being charged with the commission of a “serious violation,” and whose behavior poses a significant threat to the safety and good working order of the facility shall be placed in to Pre-Hearing Detention status. Punitive Segregation Unit (PSEG): A housing unit consisting of cells designated to confine inmates who have been found guilty at a disciplinary hearing and sentenced to a period in Punitive Segregation as well as inmates who have been placed in Pre-Hearing Detention status in accordance with Directive 6500R-D, “Inmate Disciplinary Due Process." a. Punitive Segregation I: Inmates who are found guilty of violent Grade I infractions shall serve their sentences in Punitive Segregation I Units, where they may be locked in for up to twenty-three (23) hours per day. b. Punitive Segregation II: Inmates who are found guilty of non-violent or Grade II infractions shall serve their sentences in Punitive Segregation II Units, where they shall be locked out for up to seven (7) hours per day. c. Restricted Housing Unit (RHU): Restricted Housing Units are designated for inmates who have been found guilty of an infraction and sentenced to a disciplinary penalty imposing a term of punitive segregation or are in pre-hearing. Punitive Segregation Inmates: The status designation of an inmate who, pursuant to Directive 6500R-D, was charged with and found guilty of committing a violation. • The inmate shall be isolated from other inmates by being secured in a holding pen in the facility intake Area pending the arrival of Mental Health. • Unless Mental Health has previously indicated that the inmate is in need of constant supervision, the Intake supervisor shall ensure that the inmate is monitored by staff at intervals no greater than fifteen (15) minutes and the observations are noted in the Intake Logbook. An inmate may not serve more than thirty (30) consecutive days in Punitive Segregation. An inmate who has served thirty (30) consecutive days in punitive segregation must be released from punitive segregation for at least seven (7) days before the inmate may be returned to punitive segregation. However, inmates who have committed a serious assault on staff that results in serious injury may be sentenced up to sixt (60) consecutive days of punitive segregation. An inmate may not serve more than sixty (60) days in Punitive Segregation in a six (6) month period unless the inmate has continued to engage in persistent, serious acts of violence, other than self-harm during or upon completion of the sixty (60) day period. Daily mental health rounds shall be provided to inmates housed in punitive segregation who have been held there longer than thirty (30) consecutive days or have served more than sixty (60) days within a six (6) month period. Such rounds must be documented in writing. When an adult inmate's punitive segregation sentence exceeds forty-five (45) days, the Chief of Department or a designee shall complete a review of the sentence forty-five days after its commencement to determine whether the inmate could safely be placed in an available alternative housing unit for the remainder of the sentence. When the inmate is a Young Adult, the review shall take place every fifteen (15) days. Inmates found to have violated the Code of Penal Discipline are subject to a variety of sanctions, including punitive segregation in the case of assault on prison staff and other serious offenses. Commitment to punitive segregation must be for a definite period, with the period depending on the type of offense the inmate has committed while incarcerated. The period is up to 30 days for conviction of assault on a DOC employee, holding an employee hostage, or rioting. Any inmate found guilty of these offenses must be reviewed for placement in administrative segregation (a less restrictive level of segregation) before he completes the punitive segregation sanction. 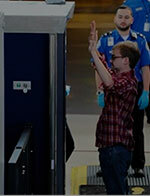 The X-ray type image enables the operator to see any contraband that someone is hiding on or in his/her body. © 2018 Cotalk, All Rights Reserved.